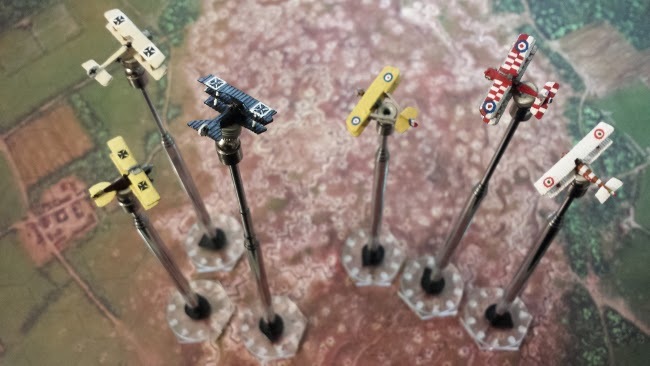 Without a doubt, Canvas Eagles is one of JADE's favourite miniatures games. It was the fierst game (aside from magic the gathering) that we really got into as a group, and we still play it to this day. 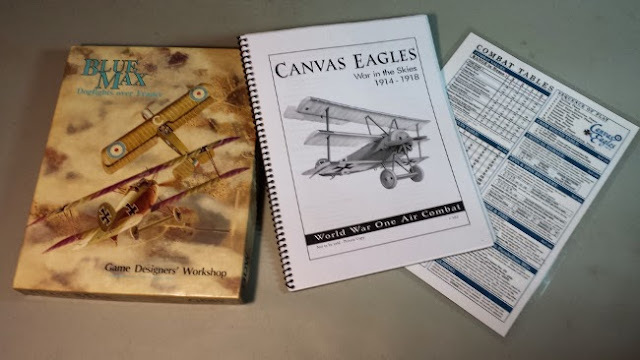 Canvas (as we call it) let's you take control of a World War I fighter plane and dog fight other players as you duel to the death in the skies. The game was originally released in 1980 as Aces High and then was re-released again in 1983 as Blue Max. Canvas Eagles is the third edition of the game, and was a released in 1999 by Eric Hotz (one of the original designers) who decided to release the rules for download for free. 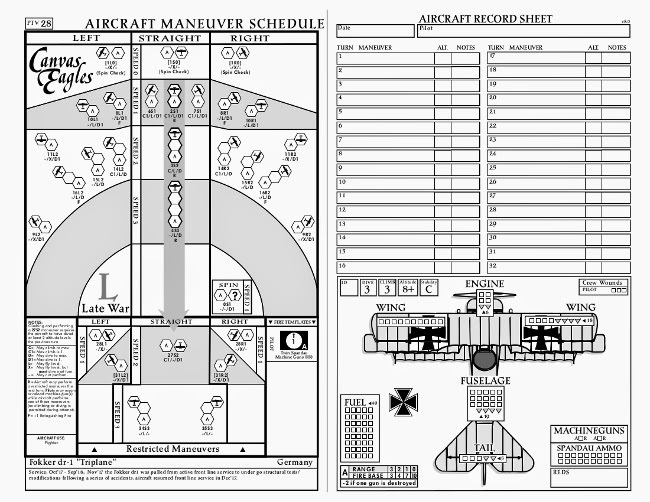 Canvas Eagles uses a hex grid, telescoping stands to represent altitude and position, and aircraft sheets that list the capabilities of each plane. Now there is not a lot of official support for this game, so you will need to find the stands, minis and board all on your own. But luckily we are here to help. JADE plays Canvas Eagles in the 1/300th scale, and we got most of our planes from Heroics and Ros. The reason we chose such a small scale is because it makes them compact and they are cheap: averaging around $1.50-$2 A plane. The stands we purchased from Corsec Engineering. 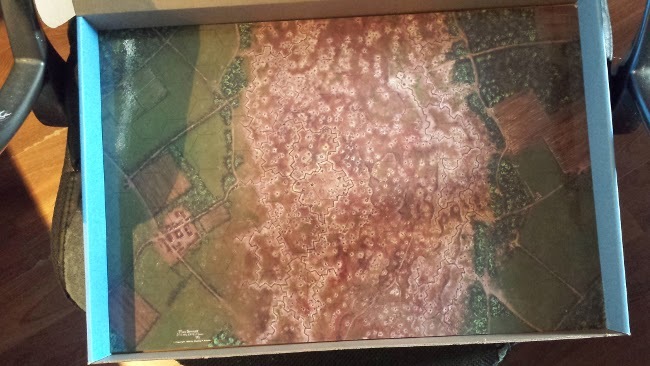 And our game board is from Aerodrome 1.1, though we have recently upgraded to a larger game mat from Hotz Mats, made by the same Eric Hotz who released the Canvas Eagles rules. 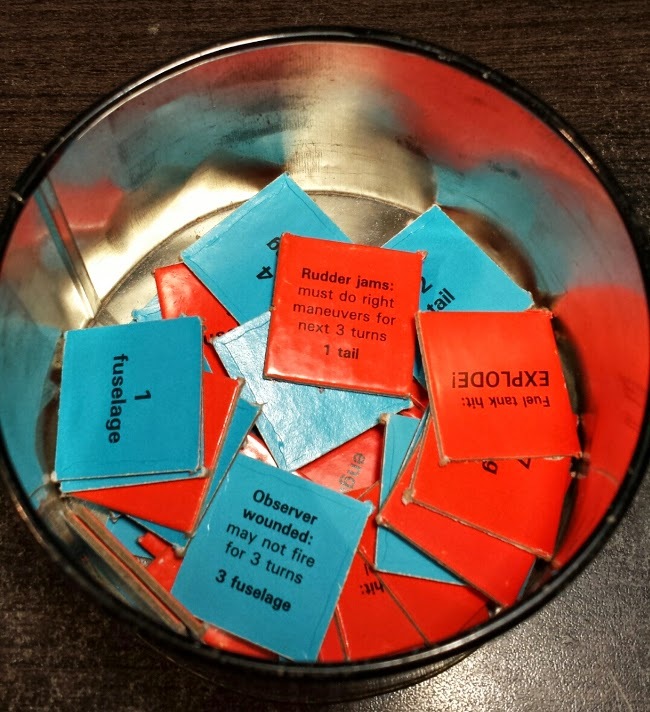 The game uses simultaneous action selection and movement, so each turn players select the move they wish to preform (You are given a list. See below), and if you want to shoot or not. Then all player enact their selected moves simultaneously. So it really has non-stop action, since it is always your turn. If your shot hits another player (there are tons of firing arcs) then you reference a chart, roll some dice and the player draws that many damage chits, which are either Blue for light damage or Red for heavy damage. We like to use the chits from the Blue Max because there are more instant Death chits than Canvas Eagles uses. If you are looking for a quick game that will keep you on the edge of your seat, or you just love biplanes, then Canvas Eagles is the game for you! Though if you are not a fan of hex and counter games, maybe look somewhere else.